Just hearing the word “lice” makes my head itch. So you can imagine my dismay the first time I got an alert from my daughter’s preschool that a child in her class had lice. In the years since, lice notices and the requisite head checks have become a fact of life once school starts. It makes me wonder how many times my kids are being exposed to louse-infested heads. The Facts of Lice iPhone app (free on iTunes) is designed to answer that question with warnings about lice outbreaks in your area. The app relies on individuals in your community using the app to report outbreaks. Reporting is easy. You enter the school name, town, state, zip code and severity of the outbreak (one classroom, multiple classrooms). The report will stay live in the app for the subsequent three weeks. You can view outbreak reports on a local area map. Of course the app will only be as useful as those who use it make it, as far as outbreak reporting goes. 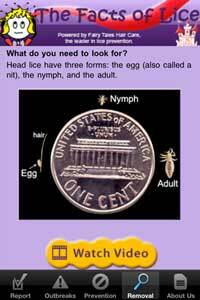 The app also provides pictures of what lice look like at different stages in development—nits, nymphs and lice—and videos on lice removal and prevention. The app is underwritten Fairy Tales Hair Care, so fair warning that the videos are basically ads for their products. For more information on lice removal and prevention, check out the Centers for Disease Control and Prevention advice.